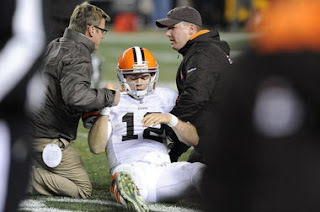 The Colt McCoy Concussion Conundrum continues. Colt McCoy was cracked in the head on December 8th and he *still* isn't clear to play. Let me tell you now, that makes me angry. Very, very angry. I'm not upset at Colt, let's make that clear. The kid is doing the best that he can. I'm frustrated however with Coach Pat Shurmur. Whenever he is asked about the hit or anything to do with the medical follow up, he is a mumbling, bumbling fool. He is either a callous and uncaring man or galactically stupid. He is in over his head and being angry with him is like being angry with the puppy that piddled in the corner. Which brings me to Mike Holmgren. I am angry with Mike Holmgren. This guy knows better. He was brought on to the Browns to provide stability. The team was going to learn from his wisdom and championship experience. He was supposed to be the leader. When Holmgren came on board, and even when he putted by me in his golf cart at training camp, I was rooting for him. For the love of all that's holy, Browns fans are sick of losing. We want to win. We want someone that can show us what a champion looks like. It has been far to.long in Cleveland for anyone to remember. The fact that Holmgren claimed that he didn't see the crushing hit on McCoy is ridiculous. How no one on the sidelines, no coaches or trainers saw it is a problem. A hippopotamus sized problem. A hippopotamus in a tutu dancing an Irish jig in the middle of the living room kind of problem. What was he doing besides watching the game? Was he in a suite? I can tell you, if he had been, there had to be at least 3 or 4 tvs around him. Didn't anyone poke him and say, "holy crap your boy just got his clock cleaned"? No reporter, bystander or cookie cart lady said anything? How is that even possible? The guy didn't see his quarterback on the ground? 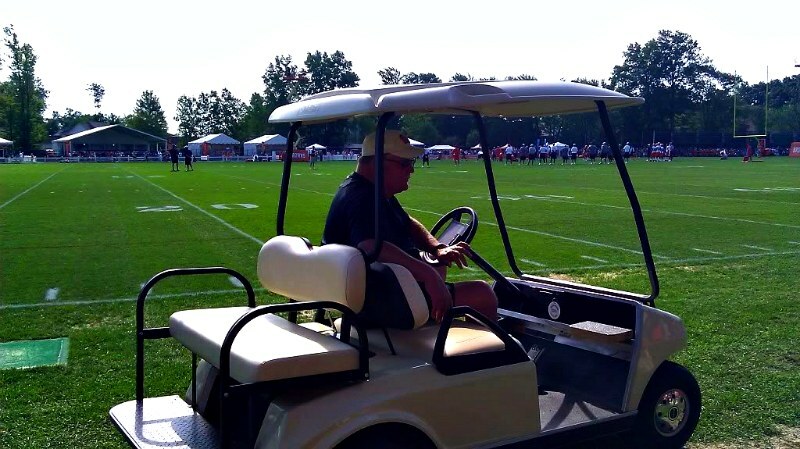 Holmgren is no spring chicken. He has been around the NFL long enough to know that hit on McCoy could have been career ending. The kid has three conclusions under his belt already. From here on, each one becomes more serious. Ex-Colts player Ben Utecht is 30 and is already suffering from frightening memory loss. He had 5 concussions in his career. There is no way that Holmgren took the Cleveland job thinking it was going to be a day at the beach. Turns out the Big Show is nothing but a Big Disappointment.